In December 2018, we started planning a surprise for my mother who turned 75 yesterday. Amma doesn’t wear new saris and she doesn’t like parties etc, but she loves the place that she was born and grew up in – Tirunelveli. So Krishnan suggested that we celebrate her 75th at Tirunelveli. I immediately booked our flight tickets and made hotel reservations. Then I called up mom’s youngest brother, Seenu Mama to ask if he could join us as we didn’t know much about Tirunelveli and he would know all the places that Amma wanted to go to. Mama was also able to join a day later, on Amma’s birthday. Once the bookings were done, it was a question of keeping it a secret and Mama, Krishnan and I never mentioned it to anybody else. We came back from the Kumbh and told Amma that I have a meeting in Chennai and thought that we could all go for a couple of days to Chennai. She boarded the flight unsuspectingly, thinking she would get to meet her sisters and Seenu Mama there. Once airborne, we gave her the first surprise that we were going to Tirunelveli for her birthday. She was thrilled and started planning on all the places that she wanted to go and see. On Feb 12th when we reached Tirunelveli, we told Amma that she has to get us the phone numbers of her cousin’s from Seenu Mama as we didn’t know the places that she wanted to visit. Mama sufficiently delayed giving the information so that we could delay calling them to the next day :). Mom’s school friend Seshi was also in Tirunelveli by chance and Mama had already told me about it, but we didn’t tell Amma. I suggested to Amma that she should buy her friend a sari and a dhoti for her husband as they celebrated their “Sathabhishekam” (Completion of 80 years of the husband) just a week back. 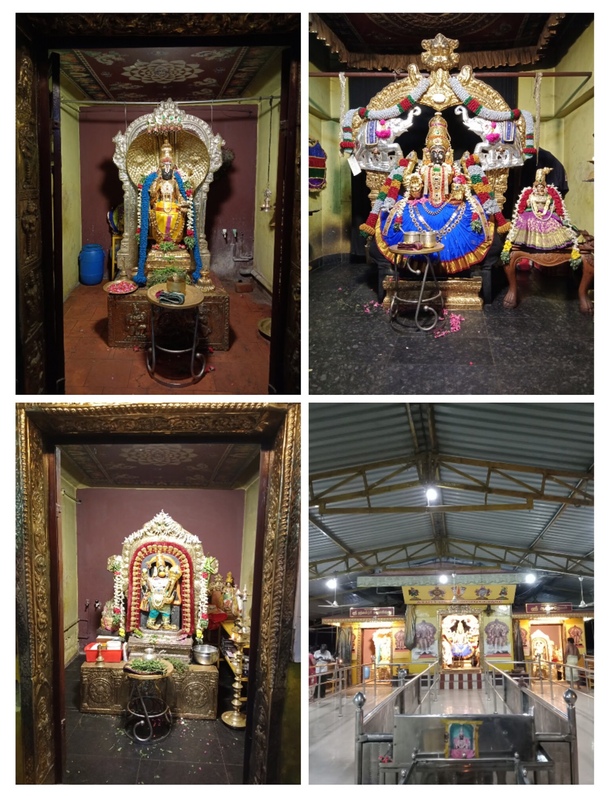 Their son was the “archakar” (priest/pundit) at the Varadaraja Perumal Temple that stood at the beginning of the street where Amma and Mama and all their siblings grew up. I suggested to her that she can hand over the sari and dhoti to him since she couldn’t attend the ceremony earlier. We took Amma to the original RmKV store near the Nellaiappar temple where Amma’s wedding sarees were purchased in 1968. We bought a saree for her friend, one for her as the birthday saree that I had ordered on Cooptex didn’t get delivered in time for her birthday and we bought a dhoti for her friend’s husband. We then walked down to the famous Laxmi Vilas sweet shop that has been in existence since 1882 and sells the famous Tirunelveli Halwa made in Ghee while all other places make it in Dalda/Vanaspati. We had some halwa and then walked across to the “Central” restaurant to eat Aloo Bonda, a snack that Amma loves. We managed to keep the surprise of Seenu Mama joining us intact. The next morning we woke up and wished Amma and then told her, we will first go to the Varadaraja Perumal temple and then go to her friend Seshi’s house to hand over the sari and dhoti to their son and daughter-in-law. When the bell rang at 7.30 Amma thought it was someone from the hotel to clean up the room and she was pleasantly surprised to see Seenu Mama walk in. We then told Amma about all the planning that went in behind her back to surprise her on her birthday :). After breakfast we went to the Varadaraja Perumal Temple first. I have very fond memories of the temple as I would visit it almost everyday when I came to Tirunelveli during my summer holidays. There is a Hanuman temple inside this one which was my great-grandmother’s favourite. We had a good visit and then walked across to meet Amma’s friend Seshi. Both the friends were thrilled to meet each other after several decades. They were neighbours and school friends. 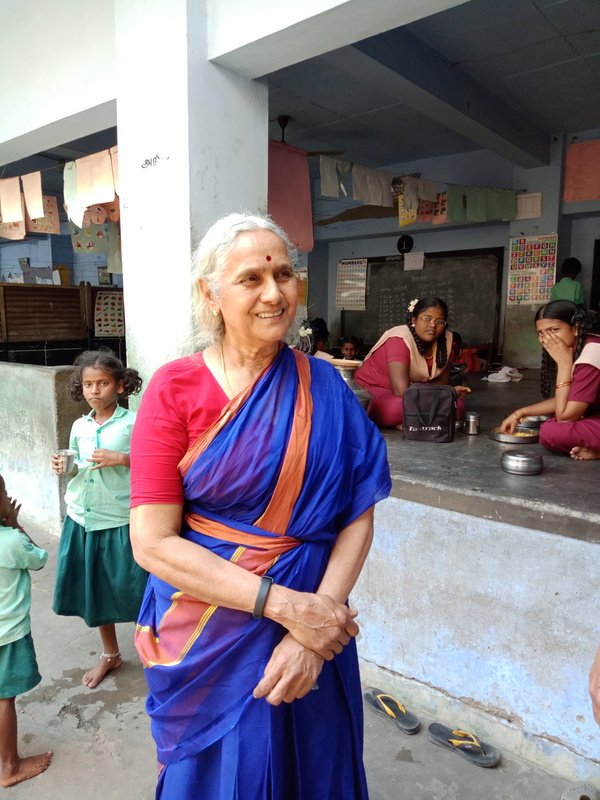 After her marriage, Seshi just moved a few houses down the street and by the time Amma got married, she had several children. Mom’s friend looks just as beautiful even today and the collage below shows them chatting away with each other. The Varadaraja Perumal temple. Am wearing a Moirangphee and Amma is in her new birthday saree. 1st pic is Amma, her friend Seshi, her husband and Seenu Mama. 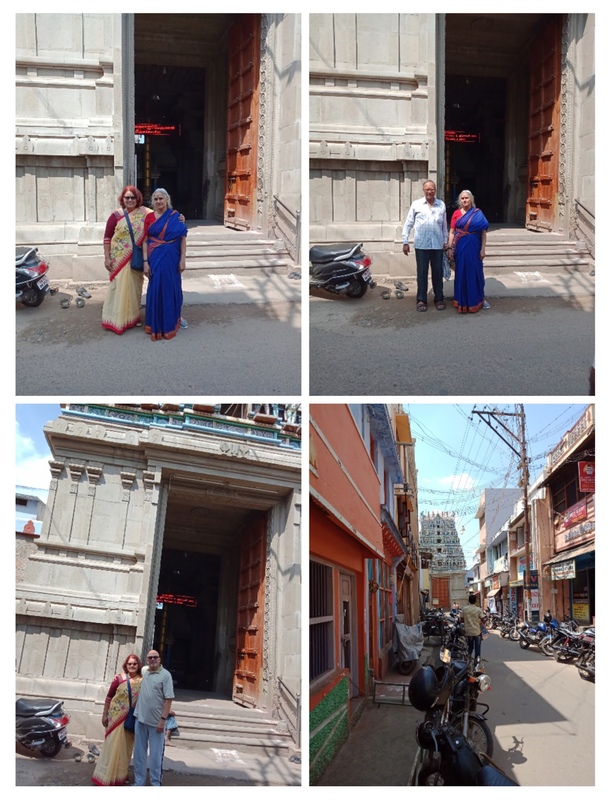 2nd pic is Amma and Seenu Mama at their school and a picture of their school inside. 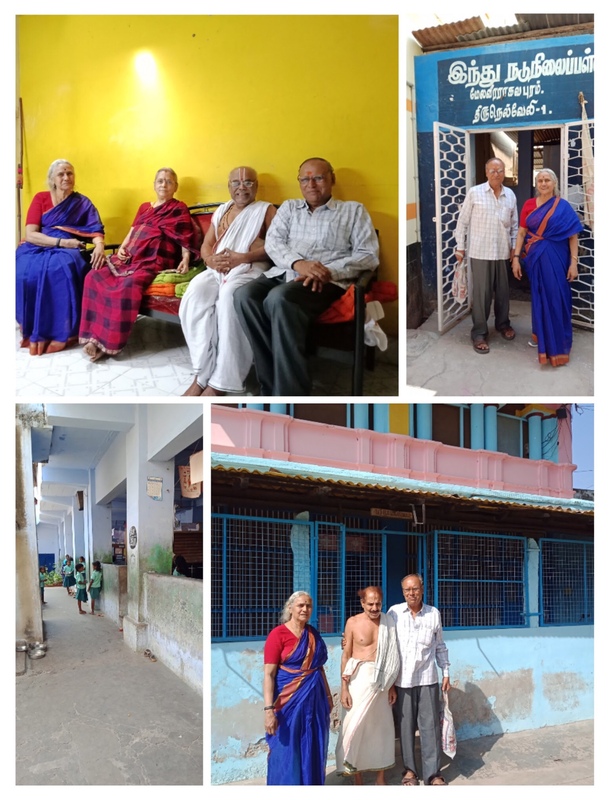 The 4th pic is Amma and Mama with their cousin (he lives in Vittalapuram). After spending an hour or so with Amma’s friend, we went to their old school, that was called “N P Krishnaiyer School” earlier and now is called “Hindu Middle School”. Amma and Seenu Mama discussed all the changes that had happened and then we walked into the school. Since it was close to meal time, the girls were having their mid-day meal. The picture below is one of the best photographs of Amma that I took yesterday. From the school we went to have lunch and then took another Ambassador taxi to go a nearby place called Azhugudi which is where my grandfather had a lot of his agricultural land. They also had a house there which Amma wanted to see. On the way we stopped by at her cousin’s place in Vittalapuram. 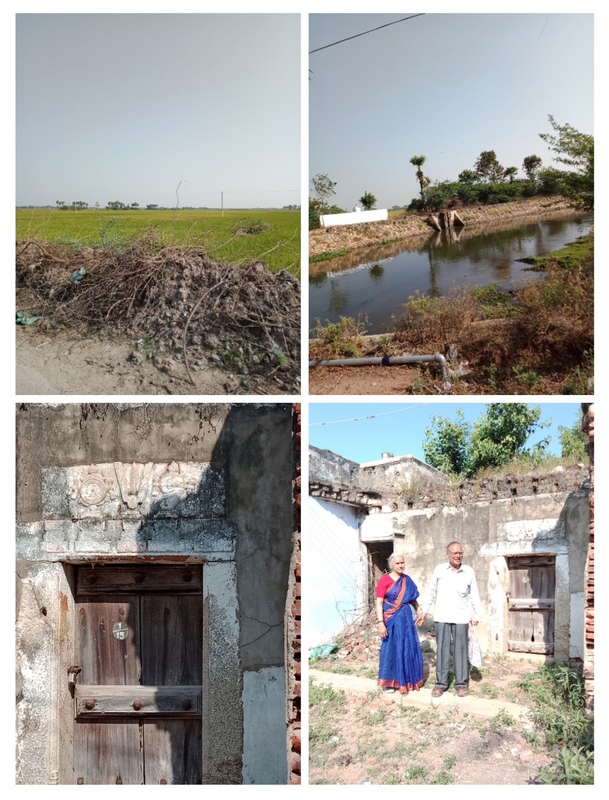 The house in Azhugudi is unfortunately in ruins as no one has been there in almost 40+ years. Amma was upset seeing the house in that condition but there’s little that can be done. Time marches on and some things change forever. From there we tried visiting the Krishnapuram temple but that was closed. So we just got back to the hotel. At the hotel the GRT team brought an eggless cake to celebrate Amma’s birthday. Beautiful gesture from the hotel. In the evening we went to another temple called “Getwell Anjaneyar” temple. Again here one of Amma’s friend’s son is the “Archakar”. He wasn’t there but the temple is very beautiful. I just wanted to pick up the Hanuman “vigraham” (idol) and bring him home – he had beautiful eyes that seemed to be almost live. This is a newer temple unlike the Varadaraja Perumal temple that is nearly a 1000 years old. Besides Hanuman, there is a temple for Dhanvantri and Sri KanakaMahalakshmi in the same complex. We then walked down to the bus stand and ate a “bhajji” another fried snack that Amma likes a lot. Amma was absolutely thrilled with this kind of birthday celebration. She got to see the places she grew up in and meet her school friend as well. 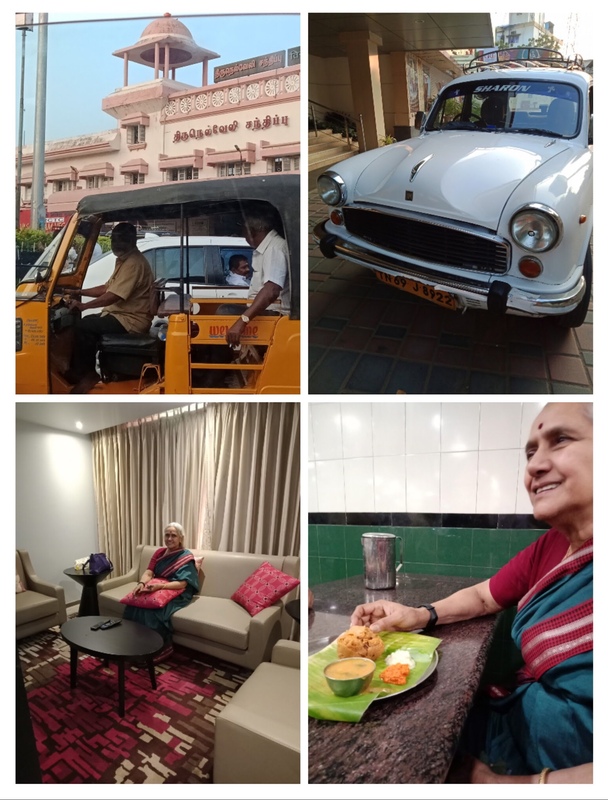 Krishnan and I also enjoyed seeing Amma walk down memory lane, in her element, surrounded by people that she grew up with and in the place that she loves a lot. Happy birthday Amma and wish you many many happy returns :):). You always inspire me ma’am, bday wishes to Amma 🙂 hope she remembers me. Thanks Ashoke Ji. She stays with my cousins when we travel outside the country. We are part of a very large family and lots of cousins 😀. Excellent write up with beautiful pictures as usual. It felt like I joined your trip as well. Happy birthday to Athai and wish her many more to come. Job well done Malu Akka and Athimber. Awesome Wonderful …. veryy good plan .Hope Athai had marvelous birthday memories. Athai many many more happy returns of the day. What a wonderful birthday gift and celebration. All the best to your Amma!